I took one half of the chicken breast (so one side) and cubed it up and put it into a bowl. Then I chopped up the walnuts and added these to the bowl, along with the slivered almonds (I didn’t bother chopping these). I added a bit more than 1/4 cup of raisins to the bowl. Then I chopped up the stalk of celery and added that to the mix and finally, mixed it all up with mayo (to the consistency I preferred). Voila! I laid a bed of lettuce on one of the slices of bread to keep the bottom piece from getting soggy, then took about 1/4 of the mixture and spread it onto the lettuce and topped this off with the other piece of bread. That’s it. You could add sliced tomatoes if you want or add whatever you like to the mixture. You could add grated carrot to the mix or just about anything. You can add salt and pepper or other seasonings if you wish but I found it was really good without seasoning. I could really taste all the ingredients in the mixture. I served mine with some fresh strawberries and boy, what a treat. I feel very satisfied and energized. Give it a try! 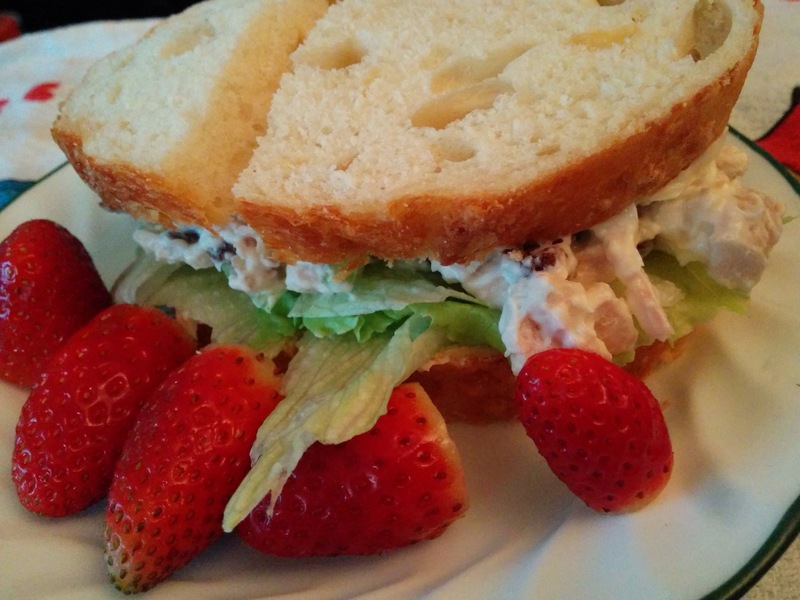 Or if you still have some leftover turkey, make it a turkey salad sandwich. Or do away with the bread and make a wrap or add the mixture to the top of a green salad. The possibilities are endless. No more boring chicken salad of my childhood — exciting, crunchy and soft… YUM. This entry was posted in Breakfast, Brunch, leftovers, Leftovers repurposed, lower sodium, Lunch, no-cook, quick meals, quick-and-easy, recipe, sandwich and tagged almonds, bread, celery, chicken, lettuce, mayo, raisins, walnuts. Bookmark the permalink.